Height-Adjustable Standing Desk with a full load capacity of 80lbs and a generously sized surface 20.8" W x 11.4" D, this ergonomic stand up desk. EASY ADJUSTMENT IN JUST 3 SECONDS! Smartly designed with an AIR PUMP mechanism, this height adjustable desk conversion unit is ideal to take you from sitting to standing position in no time! Treat Yourself To The Ultimate PAIN-FREE Work Experience With A Smart Standing Desk! Are you tired of your stiff neck, aching back and sore wrist due to the long office hours before the computer screen? Have you had enough of spoiling your concentration as you change between the sitting and standing position for your work needs? Are you in search of an ergonomic height adjustable standing desk for your kids that are passionate with online gaming? Say Hello To The Last Stand Up Converter You Will Ever Need! Shift from sitting to standing within JUST 3 SECONDS and say goodbye to the inconvenience of fixed computer stands that give you a headache at the office or home! A Stand Up Desk That Stands Out! No more bulky height adjustable standing desk, no more time consuming installation! No tools, no handyman is needed to have your new sit stand desk converter ready for use! You can order yours now in peace of mind, as it is backed by Full Refund Policy to help you buy with confidence! ✡ KEEP YOUR EQUIPMENT AT EYE LEVEL! Have you had enough of small computer standing desk that get overflowed in a breeze? Stand up desk with a full load capacity of 80lbs (36kg) and a generously sized surface 21" W x 11.4" D, this ergonomic standing desk that will hold your monitor, keyboard, mouse, phone making a MUST-HAVE standing desk converter for home and office use. ✡ EASY ADJUSTMENT IN JUST 3 SECONDS! Smartly designed with an AIR PUMP mechanism, this height adjustable desk conversion unit is ideal to take you from sitting to standing position in no time! 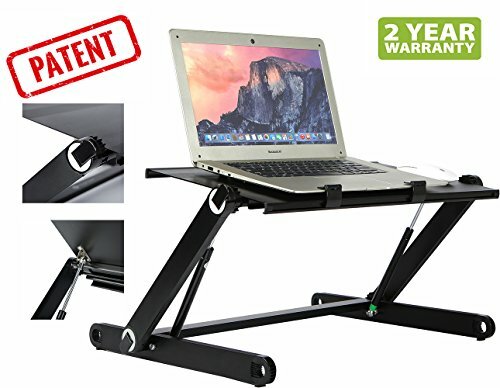 FAST, EFFORTLESS and STEADY, this stand up computer desk promises will relieve your aching back, neck pains and wrist issues adjusting its height from 4" to 18". ✡ PERFECT FOR 1000+1 PURPOSES! Smartly designed to serve your changing needs, this adjustable standing desk will suit countless purposes, to make your daily activities EASIER and more CONVENIENT. Use it as a, cozy desk ,laptop stand, microphone, DVD player and have all your essential tools at your fingertips! ✡ PREASSEMBLED & READY TO USE! Save yourself time and effort with the preassembled sit-stand desk converter! It arrives fully assembled, so you can take it out of the box and start using it right away! Just place your desktop sit-stand workstation on your desk, choose your preferred height and you're ready to go in premium comfort! ✡ THE BEST STANDING WORKSTATION OR YOUR MONEY BACK: At Ying Tripod we take great pride in our office stand up desk and we guarantee that it will offer you the ultimate pain-free working experience! This is why we are backing our product with 100% Money Back Guarantee, making your shopping experience absolutely RISK-FREE! If you have any questions about this product by Ying Tripod, contact us by completing and submitting the form below. If you are looking for a specif part number, please include it with your message.